The Practical guidance for the management of palliative care on neonatal units will be formally launched on Thursday 13 February at 2pm at Chelsea and Westminster Hospital. Despite advances in neonatal medicine, sadly many babies will suffer from conditions that mean they will not survive longer than months, days or a few minutes. The purpose of the guidance is to help clinical staff deliver care for babies that is of the highest quality, and provide families with the support they require. Caroline Friel, mother of baby Brigid, said: “Nothing can prepare you for the death of a child. It is vital that the staff who are caring for our babies and supporting us through this difficult time are trained and equipped to do so with an understanding of the procedures and protocols that will allow our babies to die with dignity, whilst ensuring that they do not suffer unnecessarily. It is also important that this is done within a framework that allows the families to have their concerns heard and their wishes considered. The guidance was developed by members of the neonatal team at Chelsea and Westminster Hospital that included doctors, a nurse, a psychologist and a hospital chaplain. It has been endorsed by the Royal College of Paediatrics and Child Health after several rounds of stakeholder consultation, including key charitable organisations and professionals within the field of neonatal palliative care. The development of the guidance was funded by the Department of Health and the production and publication was supported by the Chelsea and Westminster Health Charity. The guidance includes a foreword by Sir Bruce Keogh, National Medical Director for NHS England and real-life experiences of families whose babies have received such care. 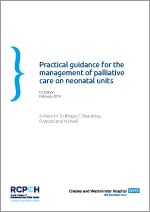 Hard copies of the guidance will be sent to all neonatal units in the country during February and it will also be available to download, along with all of the supporting documents, from the Royal College of Paediatric and Child Health website. It was also be available from a number of charity and stakeholder websites including Bliss, British Association of Perinatal Medicine, Child Bereavement UK, The Multiple Births Foundation, Stillbirth and Neonatal Death Charity and Together for Short Lives.